Make the most of your massage sessions with this two-in-one massage assistant and storage unit. Designed for use with RAD Rounds and RAD Roller. The Block doubles as a massage assistant and compact, portable carrier for the RAD Roller and Rounds. Pop the RAD Roller and Rounds into the slots for hands-free, isolated pressure in tight areas like the adductors, shoulders and pecs. By using your RAD Roller and Rounds in the Block, it stabilizes the tools for targeted massage without rolling. It also elevates them to provide better leverage for hard-to-reach spots, making it easier if you have limited mobility, are recovering from injury or are newer to exercise. When not in use, the Block allows you to keep all items together for storage or easy transport wherever you go. 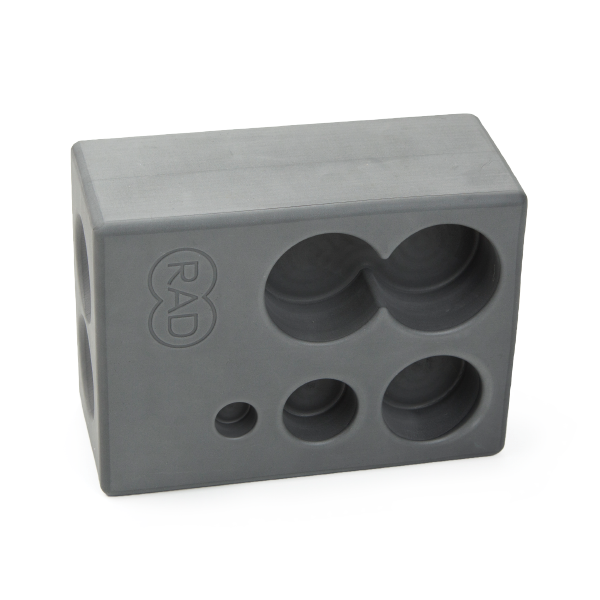 Dimensions: 8.5" x 6.25" x 3.75"
Designed for use with RAD Rounds and RAD Roller.